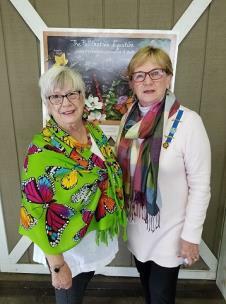 The Barn Nursery opened up the welcome mat to the Judge David Campbell Chapter where they held their luncheon and meeting. 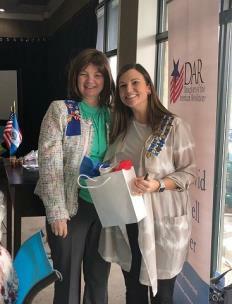 The Judge David Campbell Chapter, NSDAR, awarded and presented Sharen Fisher and her dog Quinn the “DAR Community Service Award.” Quinn and Sharen are a part of the Alliance Therapy Dogs and have tested over 43 dog teams. They have accumulated 658 visits to date. 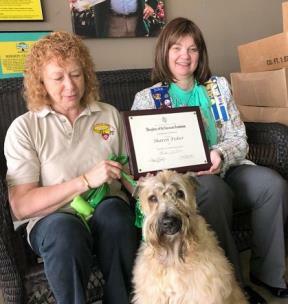 He was selected as National Wheaten Ambassador in October by the Soft Coated Wheaten Terrier of America Club and awarded a plaque at the Montgomery, PA Terrier Dog Show, one of the most prestigious shows in the U.S.
Jennifer Thomas was awarded the "March Bee Award," for "beeeeing" an Outstanding Junior. Ms. Thomas is involved with multiple committees and is also a part of the state’s Junior Sales. 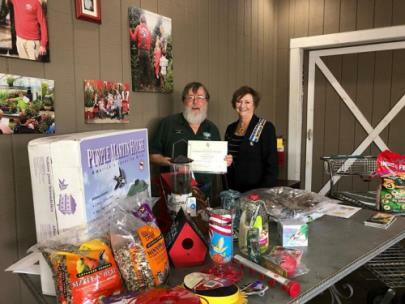 Craig Walker was the guest speaker and spoke on pesticides and plants. The Board members prepared the food and drinks for this meeting as this was one of its annual fundraisers.